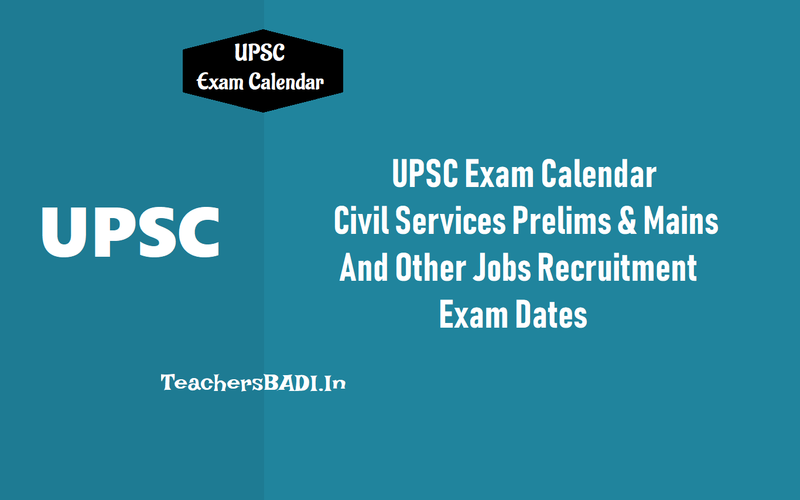 UPSC Exam Calendar 2019 for Recruitment Tests Exam : Civil Services Prelims on 2nd June, Mains in September 2019. UPSC Exam Calendar 2019 is available on the official website of Union Public Service Commission (UPSC) - upsc.gov.in, as per which, the Commission is scheduled to organize the UPSC Civil Services Preliminary Examination 2019 on 2nd June 2019 and the Main Examination will follow on 20th September 2019, next year. Apart from the Civil Services Examination 2019, UPSC has chalked out the roadmap of other national level examinations viz: Engineering Services (Preliminary) Examination, 2019 for which the notification will be released next week on 26th September 2018, and the exam will take place on Sunday, 6th January 2019. The notification for C.D.S. Examination (I), 2019 will be released on 31st October 2018 and the exam is scheduled for Sunday, 3rd February 2019. The CISF AC(EXE) LDCE-2019 will be held in March 2019; N.D.A. & N.A. Examination (I), 2019 in April 2019; Civil Services Prelims and Indian Forest Service (Preliminary) Examination, 2019 through CS(P) Examination 2019, I.E.S./I.S.S. Examination, 2019, Combined Geo-Scientist and Geologist Examination, 2019 in June 2019 and so on. The UPSC has released Exam schedule for various job tests of Civil Services, Engineering Services, CDS, Combined Medical Services, Indian Forest Services, and a total of 24 types of examinations for the year 2019. The Civil Services Preliminary Examination will be held on June 2, 2019. Main exams begin on September 20, 2019. The UPSC notification for the Engineering Services Basic Examination will be released on September 26. The calendar is embedded on the website.